You can also obtain these documents by contacting your branch office. Please note that the issuing of the documents will be charged separately. Certifies that the listed articles / article groups conform to the indications in the corresponding data sheet and have been subjected to a 100 % final test. Certifies that the listed articles conform to the indications in the corresponding data sheet and have been subjected to a 100 % final test. 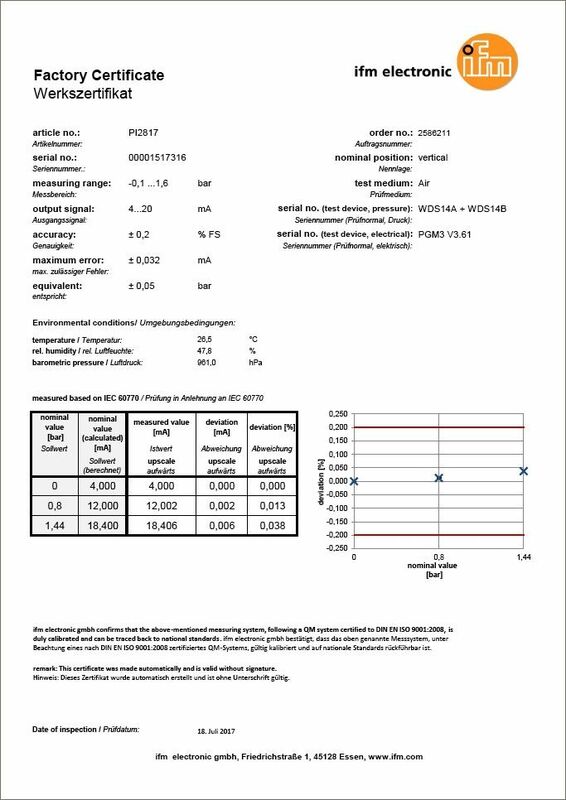 Results of batch-related tests to prove that the requirements regarding the material characteristics and quality are met. Applies to the specified article(s) and must be requested when ordering the article. Only issued for fluid sensor products (list of products). Applies to the specified article(s) and must be requested when ordering the sensor. Subsequent orders are only possible if subject unit is returned. Only issued for pressure sensors (list of products). Only issued for temperature sensors (list of products). The cleaned units are given a special marking and packaging. Applies to the specified article(s) and must be requested when ordering the sensor. Subsequent orders are not possible. For each unit ZC0019 has to be ordered separately. Applies to the specified arcticle(s) and must be requested when ordering the sensor. Subsequent order are only possible when giving the serial number. The certificate will then be dated with the day of calibration. Only issued for temperature sensor (list of products). Applies to the specified arcticle(s). The subject unit has to be returned for recalibration. Only issued for oil particle counter (list of products). Only issued for flow sensors SD (list of products). Applies to the specified article(s) and must be requested when ordering the sensor. Subsequent orders are only possible if subject unit is returned.